Mark Edwards, the scientist who worked on exposing the problems in Flint, MI, was one of my colleagues at Virginia Tech. He seems to be committed to the radical idea that people’s drinking water shouldn’t make them sick. And then his phone rang in April 2015. It was a woman named Leeanne Walters, a Flint, Mich., stay-at-home mother who was getting nowhere convincing state and local officials that there was something seriously wrong with the orange-tinted water coming out of her tap. Her family’s hair was thinning. Her son’s skin was red and irritated. They told her the water was perfectly safe. And even months later, when it had been determined there were high traces of lead in her water, the officials shrugged it off as an isolated problem. Desperately, she called Edwards, whom she had read about online. Over the phone, he walked her through how to take her own water samples. The next day she sent them FedEx to Edwards to test. It was the worst lead levels he had ever seen. First, yay Ms. Walters. Citizen-led science is never not awesome. Second, though the story highlights lousy behavior and governmental failures on the part of regulatory agencies, included the CDC, which really can’t be doing that. CDC is an agency where nothing less than 100 percent effort towards transparency and accountability is acceptable. Heads need to roll. But although much of media wants to trumpet just the government failures, ahem. Mark Edwards was educated, his entire life, at state schools–SUNY Buffalo and the University Washington. He’s spent his career fighting for clean water from a *tenured*–not contingent–position at *state* school. He received grant money, though not enough, from the National Science Foundation–a *federal* source of grant funding that some of our friends in Congress buuuuuuuuuurn to cut because it’s just a waste. He disseminated his findings via an internet that the government helped research, develop, and build. My point is not just to fling more confetti on Professor Edwards, but to point us back to a rather old-fashioned idea: that there is good government and there is bad government, and that good government is possible, and it is often all around us, invisible, and it is sometimes the only thing that is capable of standing up when government itself fails. Hippodamus son of Euryphon, a Milesian (who invented the division of cities into blocks and cut up Piraeus, and who also became somewhat eccentric in his general mode of life owing to a desire for distinction, so that some people thought that he lived too fussily, with a quantity of hair and expensive ornaments, and also a quantity of cheap yet warm clothes not only in winter but also in the summer periods, and who wished to be a man of learning in natural science generally), was the first man not engaged in politics who attempted to speak on the subject of the best form of constitution. Ἱππόδαμος δὲ Εὐρυφῶντος Μιλήσιος ὃς καὶ τὴν τῶν πόλεων διαίρεσιν εὗρε καὶ τὸν Πειραιᾶ κατέτεμεν, γενόμενος καὶ περὶ τὸν ἄλλον βίον περιττότερος διὰ φιλοτιμίαν οὕτως ὥστε δοκεῖν ἐνίοις ζῆν περιεργότερον τριχῶν τε πλήθει καὶ κόσμῳ πολυτελεῖ, ἔτι δὲ ἐσθῆτος εὐτελοῦς μὲν ἀλεεινῆς δέ, οὐκ ἐν τῷ χειμῶνι μόνον ἀλλὰ καὶ περὶ τοὺς θερινοὺς χρόνους, λόγιος δὲ καὶ περὶ τὴν ὅλην φύσιν εἶναι βουλόμενοσ’ πρῶτος τῶν μὴ πολιτευομένων ἐνεχείρησέ τι περὶ πολιτείας εἰπεῖν τῆς ἀρίστης. Oh, those urban design hipsters never change–all black clothing and Dieter glasses, all dandied up. In Athens, long hair on a man was an affectation. Rackham simply translates κόσμῳ as “a quantity of hair”; Jewett translates it as “flowing hair”; here I think Jewett has the more apt wording, as Liddell suggests “hair hanging down the back.” Not, perhaps, an entirely fair comment on Aristotle’s part; some Greek men did wear their hair long as a matter of common fashion–I think Spartans did, and Hippodamus is not an Athenian, as Aristotle points out right away. Perhaps Milesians, too, wore their hair long, and Hippodamus did so because he was used to it. Perhaps; but Aristotle was a foreigner in Athens, too (he was from Stagira) so perhaps what we are seeing is Aristotle’s comment on a fellow metic’s unwillingness (or inability) to integrate. Either way, it seems clear, through his careful description of the accessories worn over cheap but warm clothing that Aristotle thinks this Hippodamus a bit of a poseur. 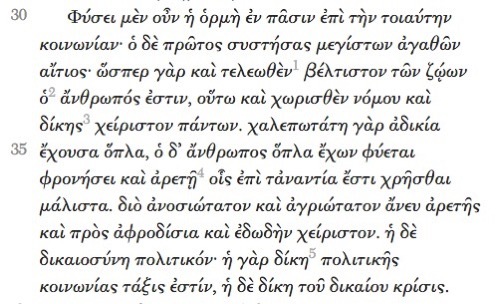 This hinting that Hippodamus is a dilettante becomes more obvious when Aristotle notes that Hippodamus attempted to speak about the best form of a constitution even though he was μὴ πολιτευομένων–not a politician. Unfortunately, as we know, there probably isn’t any more political act than dividing up land, so Aristotle probably should have been a little more inclusive in what he considered τῶν πολιτευομένων. All that said, Aristotle also seems right in the next paragraphs: although we don’t get a full recounting of Hippodamus’ argument, Aristotle’s critique makes Hippodamus’ social prescriptions seem pretty ghastly, all the same. In general, it was well-received. And my senior male colleagues held it together just fine until I suggested that male senior faculty should not order junior female faculty to take dictation. I find this funny. It’s like the very last privilege to be wrung from our mighty hands is the ability to haze junior faculty! Why, without that, LIFE WILL HAVE NO MEANING. And men won’t be able to indulge their Don Draper fantasies. Really, truly, you will not die if you have to take your own notes. I am positive. It’s time for a faculty (council) meeting (and bunch more meetings, why, God, why? I’m in such a bad mood over both David Bowie and Alan Rickman that I can’t even. And I’ve gone and confused myself in Chapter Three, when just yesterday I was boasting to wonderful former student (now wonderful professor, Stephanie Frank) that I though I had a hold on it. I’m pretty set on trying to write a little each day this semester, but I am so dysfunctional and out of it when I am really, really working on new work that I am not a particularly good teacher, friend, or wife while I do it. As a result, this comment from Edmund White during his lovely Paris Review interview always makes me feel a little better. I wish I were more at home with writing. I can go a year or two or three without picking up my pen and I’m perfectly content. The minute I have to write I become neurotic and grouchy and ill; I become like a little wet, drenched bird, and I put a blanket over my shoulders and I try to write and I hate myself and I hate what I’m writing. Writing depends upon a fairly quiet life, whereas I am a sociable person. I think every writer goes back and forth on this question; it’s a constant struggle to find the right balance between solitude and society and I don’t think anyone ever does. I find it reassuring to read the complaints of Chekhov: “My country house is full of people, they never leave me alone; if only they would go away I could be a good writer.” He’s writing this close to the end of his life. I was just thinking about this, reflecting on media. Therefore the impulse to form a partnership of and the source of man’s chief good. this kind is present in all men by nature; but the man who first united people in such a partnership was the greatest of benefactors. For as man is the best of the animals when perfected, so he is the worst of all when sundered from law and justice. For unrighteousness is most pernicious when possessed of weapons, and man is born possessing weapons for the use of wisdom and virtue, which it is possible to employ entirely for the opposite ends. Hence when devoid of virtue man is the most unscrupulous and savage of animals, and the worst in regard to sexual indulgence and gluttony. Justice on the other hand is an element of the state; for judicial procedure, which means the decision of what is just, is the regulation of the political partnership. I’m so irritated this morning by the Oregon militia dudes. It’s not that I am unsympathetic to the Hammonds–these mandatory minimums always strike me as utter bullshite, but everybody but me seems to hate judicial discretion, and this is what you get when you have mandatory sentencing. But the Bundys don’t want to talk about that. They just want to talk about how they have to pay to graze and GUMMINT and MY GUNZ! etc etc. I’m not sending them any snacks. A new spirit of the citizenship had already sharply defined itself. It was idealistic, and its ideals were expressed in the new kind of young men in business downtown. They were optimists–optimists to the point of belligerence–their motto being “Boost! Don’t Knock!” And they were hustlers, believing in hustling and in honesty because both paid. They loved their city and worked for it with a plutonic energy which was always ardently vocal. They were viciously governed, but they sometimes went so far as to the struggle for better government on account of the helpful effect of good government on the price of real estate and “betterment” generally; the politicians could not go too far with them, and knew it. The idealists planned and strove and shouted that their city should become a better, better, and better city–and what they meant, when they used the word “better” was “more prosperous,” and the core of their idealism was this: “The more prosperous my beloved city, the more prosperous and beloved I!” They had one supreme theory: that the perfect beautiful and happiness of human life was to be brought about by more factories: they had a mania for factories; they was nothing they would not do to cajole a factory from another city; and they were never more piteously embittered when another city cajoled one away from them. The passage goes on for a few more pages. The Politics is the last piece of Aristotle I am planning to revisit before turning to other study, but I haven’t been racing through it by any means. It’s slow going, which is ok. Where else am I going? A nightclub?